Well. Just woke up. Here I am in prison again. Maybe if I sing Twinkle Twinkle at the top of my lungs with really cute cracks in my voice Mom will come set me free…Didn’t work. Maybe she will notice if I dump all my blankets on the floor…Nothing. She must be dealing with The Other One. Well now I’m cold. Guess I better start crying. I don’t get why Mom doesn’t want to read Harold and the Purple Crayon for the 16th time. That porcupine is just so deserving. I think I’ll jump on the couch right next to The Other One’s head. Look at him bounce! Higher! Higher! I bet he loves this. Well there goes Mom yelling and looking stern again. Sheesh. Don’t know what her deal is. Hey look there’s a plastic ring. It looks so…delicious! Let’s taste it. It’s so yummy and plasticky! Let’s swallow it. Uh oh. Too big! I’m choking! I’m gonna die! Whew. Thanks Mom. Sorry about the puke on the carpet. But now I get a bath! Toys bubbles toys bubbles!! This is great. Dinner agaaaaain. She’s always trying to shove food down my throat. Like, didn’t I just eat a few hours ago? Guess I’ll throw it all on the floor. I’ll be sure to grind it into the carpet when she’s not looking when she lets me out of the high chair. Oh look, there’s still cheese grease on my hands. This will look great in my hair. It’s too frizzy from my bath anyway. Mom’s doing laundry!! I wanna help let me do it! I love sitting up here on the dryer. Look. There’s water coming out the top. It’s cold! I see some at the bottom of the washer too. I can’t quite reach…just a little closer…OOOOWWWW THAT’S MY EYE!! Yes, Charlotte fell head first into the washing machine. Eric had to come in and comfort her because I was laughing so hard. She was probably throwing her food on the floor at dinner because I tried to feed her this pizza. But since you are probably not a 2-year-old, I can pretty much guarantee you will like this. 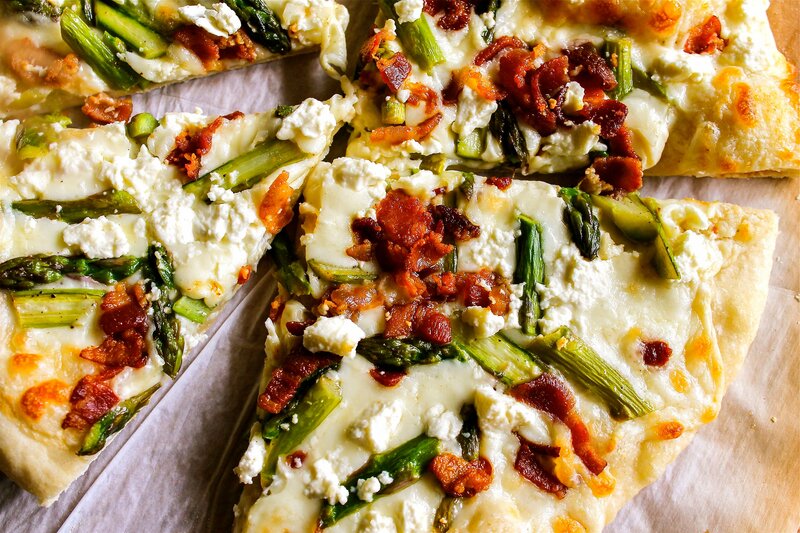 Asparagus…bacon…feta. On pizza. With a cheesy alfredo sauce. And more cheese. What’s not to like here? First make the sauce. Melt butter in a small saucepan over medium heat. 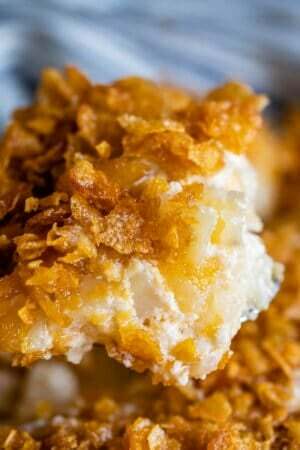 Add cream cheese and garlic powder, stirring with wire whisk until smooth. Add milk, a little at a time, whisking to smooth out lumps. Stir in Parmesan and pepper. Remove from heat when sauce reaches desired consistency. Stick the bacon in the freezer for 10 minutes so that it is easy to slice. 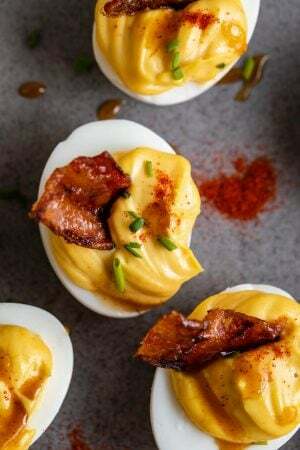 Then chop the bacon into bite size pieces and fry until it is mostly crispy. (Don't overdo it, it still has to bake in the oven). Remove with slotted spoon. Discard all but about a tablespoon of the bacon grease. Snap off the woody ends of the asparagus. Chop off the heads off the asparagus. Slice each spear in half lengthwise, then chop into 1 or 2 inch pieces. Add the asparagus to the bacon grease and saute for 2 minutes, adding salt and pepper to taste. 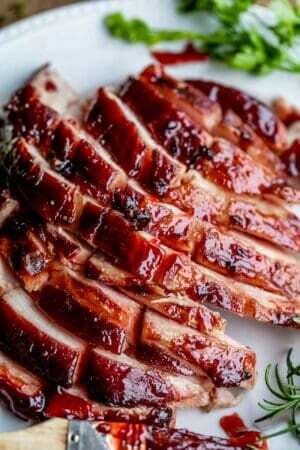 Promptly remove from heat and transfer to a plate or bowl to slow the cooking process. Roll out half of the pizza dough. (At this point I like to smear it with olive oil and bake it for one minute, just to firm up the dough before adding toppings.) Spread half of the sauce over the dough. Top with half of the mozzarella cheese. 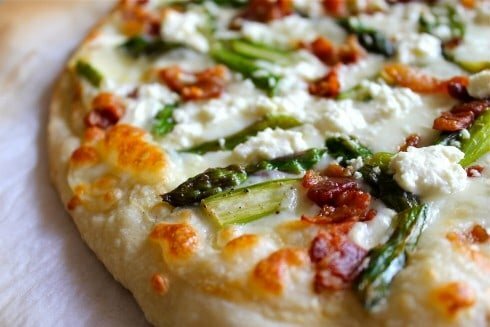 Sprinkle on half of the asparagus, half the bacon, and half the feta. Bake at 450 for 8-10 minutes. Repeat with the second pizza. 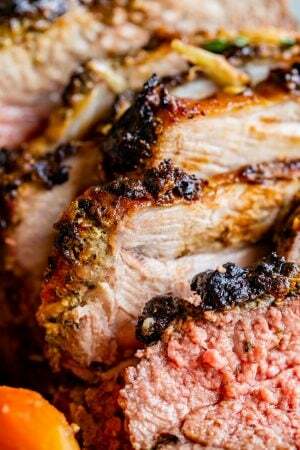 Still eating the cold leftovers straight out of the fridge 2 days after I made this and I’m loving it. 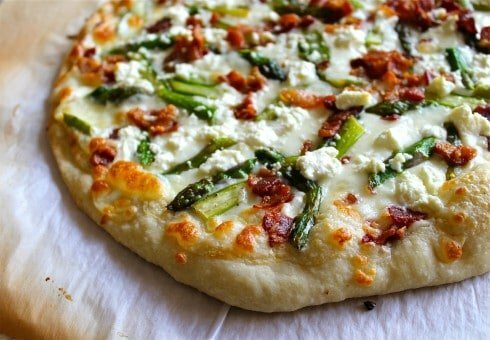 Brian says, “This is the way asparagus SHOULD be.” Total agreement – I can’t imagine even picky eaters not enjoying this cheesy bacon goodness. Something new to add to our weekly pizza night rotation for sure. It makes you wonder what “The Other One” is thinking, doesn’t it? You’re pretty good at translating, we’ll have to hear from him soon :) Wait, Char threw up a plastic ring and then fell in the washing machine? Scary and hilarious, that’s about right for a 2 year old! Man, I need to buy some asparagus soon…. Haha! Sometimes I wonder the same thing about our dog…I bet he has a pretty amusing inner monologue going on sometimes. :) This looks and sounds wonderful. I could eat homemade alfredo by the spoonful! I bet he does! And I’m with you on the alfredo. That stuff is legit.